I really want the photos to speak for themselves but there are things to note. 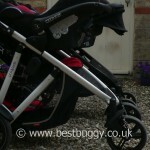 First of all, whilst the Britax B-Dual is taller and slightly wider (just 5cms! ), it is amazingly just slightly shorter than the Phil & Teds Verve. Not by much, but us here at Best Buggy were amazed! If you look at the photos the length between the wheels is exactly the same (the back and front wheels line up perfectly) but the Verve overhangs at the back because of the handlebar. 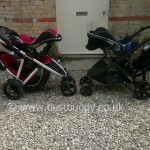 We have found this interesting because we often get asked which tandem pushchair is most compact to fit on a bus. The B-Dual because of its height and wider seats etc. comes across as much bigger, but it really is not. 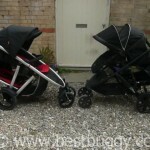 In fact for a similar sized pushchair, the children in the B-Dual benefit from better seating positions, more generous seats and you also have the huge shopping basket. The upper seat in the B-Dual photos is higher because of additional adaptors which push the seat forwards and upwards by a few inches. These are optional and included. The lower child in the Britax B-Dual benefits from a lot of space in front of them, and also enough leg room to stretch out. The child in the lower seat of the Verve, has sufficient room, but space is limited and the close proximity of the upper seat does give a claustrophobic feel. 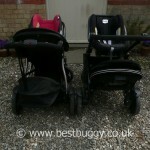 In reality the shape of the B-Dual and the Verve at the front is very similar. It is a real shame that Phil&Teds didn’t extend the shopping basket to the very front axle of the Verve, like the B-Dual, to give the lower child more legroom and more space for a bag or two. 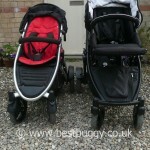 Both pushchairs offer good headroom in the main seats. 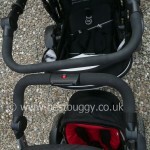 Both lower seats are a similar height, and neither have an uncomfortable bar like some other pushchairs behind the head. Therefore you could easily remove (or in the case of the Verve, slide) the lower seat hood to allow for growth. The quality of the Verve chassis is excellent. The styling, sleek lines and great looks are very attractive. The B-Dual looks more bulky. 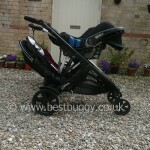 However the B-Dual feels much more sturdy, solid and comfortable. The hoods are firm and solid on the B-Dual whereas they are flimsy on the Verve. The seat pad on the Verve lower seat is constantly moving which is a bit annoying. There are straps for the child in the lower seat of the Verve to play with, dangle in their face, and to get feet tangled in. Access into the seat, both for the child, and for the adult doing the safety harness up is very poor on the Verve. 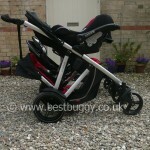 There is plenty of room for the child to climb in & the adult to do the harness up in the B-Dual. The lower seat on the Verve (at least on my model) keeps dropping off the lower notch position ie coming loose. I am finding attaching the lower seat on the Verve faffy and frustrating whereas its simpler on the B-Dual. The handling on the Phil & Teds Verve is second to none. With two children in, it is extremely light. It flies up kerbs easily. 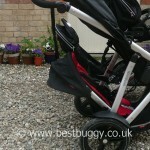 But the handling on the Britax B-Dual comes a very close second compared to other tandem pushchairs I have tried. 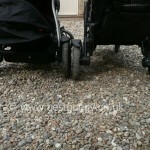 Both handle well on rough ground, but the Verve simply rides straight over our doorstep which no other pushchair has managed. I bought the Verve as my “walking pushchair” and it lives up to that expectation by making light work of carrying my children. I can’t wait to try the Verve on the beach. I could push the B-Dual forwards through soft sand easily, but I expect the Verve will be much better. 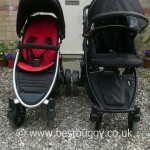 Both pushchairs are about the same weight. The B-Dual can be pulled along on its wheels. The Verve can be easily carried using the bumper bar. The Verve is a much neater package when folded with both seats on. The B-Dual folded is quite large, and hard to handle and grasp. But the B-Dual is much much simpler to fold and open than the Verve. The B-Dual has a lot of storage space even with a child’s feet in the basket (see the full review of the Britax B-Dual for more information), but there is barely any room anywhere to store even a drink on the Verve. I think most parents need to carry the basic requirements of a drink for their child or a bottle of milk, or a nappy & wipes and for that you need to consider “pimping” your Verve up with a Base Bag or Shop & Drop or similar. I have to say, if I am pushing a pushchair, I don’t want to be carrying a changing bag on my back too! In theory you could hang a bag from the Verve handlebar without hitting the head of the child below, but I wouldn’t want to put one on the Verve lest it tipped. When the child gets out of the Verve upper seat the balance of the Verve noticeably shifts. The B-Dual feels solid. 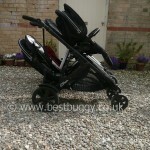 Both pushchairs take an infant carrier, with a toddler sitting comfortably underneath. You do need to recline the Verve upper seat a notch to accommodate the Maxi Cosi car seat but it doesn’t impact much on the child below. 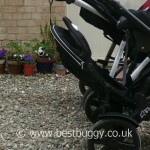 I love the neat Verve infant carrier adaptors compared to other car seat adaptors I have tried. They are easy to put on and to remove. However you do not need to buy any additional adaptors to put the Britax infant carrier in the upper position of the B-Dual. One big advantage of the Phil & Teds Verve is that it has been safety tested to be suitable to carry children up to 20kgs in both seats, as opposed to the 15kgs of the Britax B-Dual. For most under 3′s this may not be an issue, but if you have a tall 2/3 year old, or a child with special needs, then to have an extra 5kgs capacity certified could be important. Overall, size wise these two are very comparable. 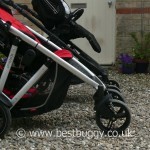 The Verve handles better & drives across anything, but the B-Dual is good to push too. 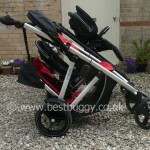 The B-Dual offers more space for the lower child plus good access to a large shopping basket. The Verve offers a neater folded package and great stylish looks.